This organ is based on early 18th century English organs, mainly the Father Smith organ at St Mary Finedon in Northamptonshire and the Gerard Smith organ at St Lawrence Whitchurch in Middlesex. The pitch is a¹=440Hz. The tuning system is one of Mark Lindley’s elegant temperaments, in which all the keys are usable, but with perceptible differences in quality between the more and less commonly used keys. The case design is based on the 18th century West country cases of Renatus Harris and the Seedes of Bristol, with arched flats and only three of the five pipes in the central tower forming a semi-circle. The Open Diapason starts from F in the front. St Endellienta’s emblematic cow is in the middle of the central pipe shade. 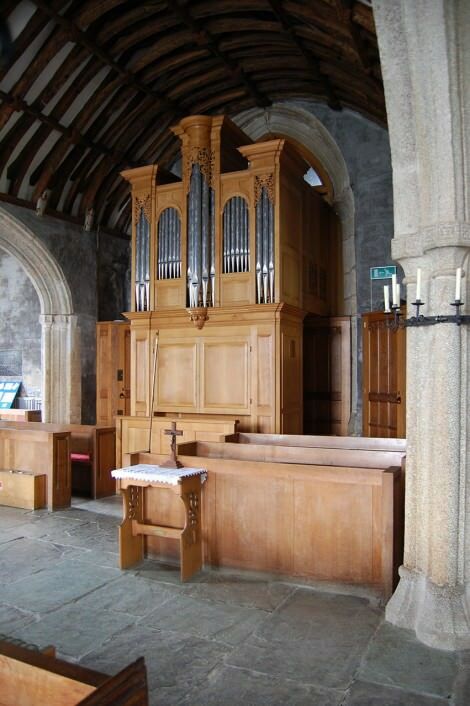 The organ was commissioned and funded by the Parochial Church Council at St Endellion, the Friends of St Endellion, the St Endellion Festival http://www.endellionfestivals.org.uk/ and the Friends of St Endellion Festival. It has been used at the Festivals, held twice a year, and recorded by Joseph Cullen on Dinmore Records DRD 031.